We meet first at Hida-Osaka Visitor Center at an altitude of 600 meters (1970 feet). Then the guide will drive you up to the trail head at 1700 meters (5680 feet). On the way to the trail head, you will see a vast view of Mt. Ontake. The trail starts at the Nigorigo Hot Spring area, with temperatures and snow incomparable to what you see in your daily life. You will go through the silent forest covered by untouched snow, and then suddenly, you will see a breath-taking view ahead. That moment standing in front of the magnificent but sacred frozen waterfall will be a scene you will long remember. The frozen waterfall gets as big as 20 meters (66 feet) high and 50 meters (164 feet) wide. It starts forming in early November and will drop and disappear by the end of April. The local guide who knows the area better than anyone will take you to the waterfall in all its beauty. The trail is about 4 kilometers (2.5miles) and takes about 3 hours round trip. It’s a complete snow trail which requires snowshoes and spikes. The air gets as cold as -20℃ (46℉), and the snow piles up as high as 2 meters (6.6 feet). Physical toughness and the ability to walk and stay outside in these conditions is necessary for this tour. This tour does not include lunch; thus, you need to bring your own lunch to have outdoors. You will go to see the same waterfall as on the Regular Tour. What’s more special about this tour is bathing time in the hot spring and a wonderful lunch at a ryokan in Nigorigo. Nigorigo Hot Spring is a hot spring resort located at the highest altitude in Japan. It operates throughout the year even during the harsh winter. Temperatures in Nigorigo remain below 0℃ (32℉) in winter. You can experience this hot spring bath both indoors and outdoors surrounded by beautiful snow. The ryokan chef prepares tasty local and seasonal dishes. On this tour, you spend less time at the frozen waterfall, but have quality time at the hot spring and ryokan after the tour. Available every day from Saturday, January 26 to Sunday, March 17, 2019. ※Regular Tours are not available on the dates Deluxe Tours are scheduled. Reservations are necessary. Please scroll down and click the button to make a reservation. The Deluxe Tour is scheduled only on the dates below. ※Staying at a ryokan in Hida-Osaka the night before is recommended because of the early morning start. Please contact us for more details about ryokans. ※Hida-Osaka is a 1-hour drive from downtown Takayama and from Gero Hot Spring. ※The JR train from Takayama arrives at Hida-Osaka Station at 7:46 AM, and from Gero at 8:07 AM. Leave Hida-Osaka Visitor Center. You will be driven up to the trail head, stopping at an observation point on the way. Arrive at the trail head in Nigorigo Hot Spring. Start trekking. Trekking distance is about 3 kilometers (1.9 miles). Arrive at the frozen waterfall site. 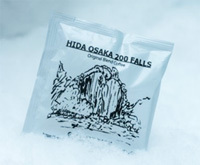 Have lunch on your own and enjoy the time around the frozen waterfall. Return to the trail head in Nigorigo Hot Spring. ※For those who plan to stay in Nigorigo the night before, we will give specific instructions about where and when to meet. The tour price remains the same. Leave Hida-Osaka Visitor Center You will be driven up to the trail head, stopping at an observation point on the way. Arrive at the frozen waterfall site. Soak in the hot spring and have lunch at the ryokan in Nigorigo Hot Spring. Free transportation from Hida-Osaka Station is available. Please make a requestat the time of reservation. Age range: 10 to 70 years old. Please contact us if the number in your group is more than 7. Regular Tour JPY 9,800 including the guide, and gear. Deluxe Tour JPY 13,300 including the guide, gear, lunch and hot spring. Cash on the day of the tour, or PayPal. Your lunch, if you are going on the Regular Tour. Please make a reservation via the website at least 3 days before the tour date. Complete names of all participants are required to obtain entrance permission to the national forests. Reservations are available via phone or internet. Reservation will be closed on any given day when the maximum number of participants is reached. Snowshoes, Snow boots, rain coat and pants, gloves, sunglasses, and helmet. ※Participants may use their own equipment if preferred. The tour price remains the same.